The Rag Blog: Marc Estrin : M'aidez! M'aidez! 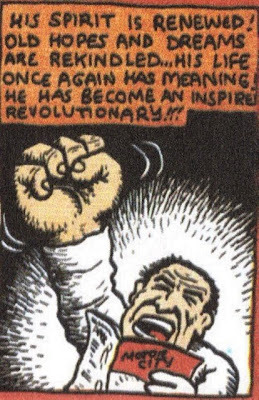 Cartoon by R. Crumb from Motor City Comics. SOS was the Morse Code signal requesting aid. Mayday became the oral radio code, probably a corruption of the French m’aidez, “help me." And “help me” was what political Mayday has traditionally been about -- a day of international workers’ solidarity. This notion was eventually too much for capitalist, fortress America, which don’t need no help from nobody, and in 1961 (yes, under JFK), Congress passed a bill creating May 1st as “Law Day." That’s right, as you watch all those nice blue flowers come up, you can let your mind drift to the men in blue who protect and serve, if you are white and middle or upper class. A quick web search of “Law Day” sites shows an interesting evolution of the custom. Many are now maintained by lawyers’ and law school organizations, and are dedicated to the notion that lawyers are essential to “freedom under the law." This may be, if you are rich enough to retain the right one. 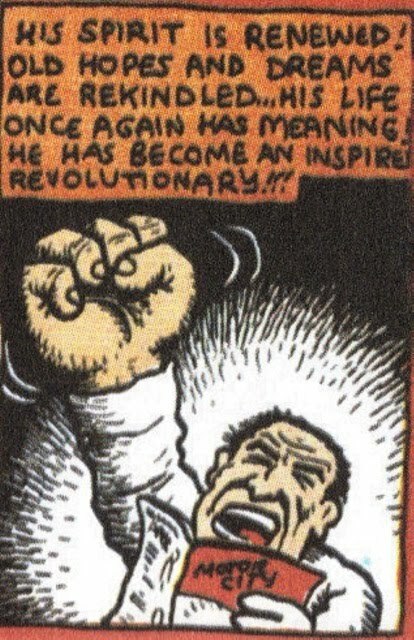 But there are enough people who remember the political origins of May Day to be using the calendrical energy to combat the oppression of corporate globalization and U.S. imperialism. Against Maie Day, Whitsunday, or some other time of the year, every parish, town, or village assemble themselves, both men, women and children; and either all together, or dividing themselves into companies, they goe some to the woods and groves, some to the hills and mountaines, some to one place, some to another, where they spend all the night in pleasant pastimes, and in the morning they return, bringing with them birche boughes and branches of trees to deck their assembles withal. But their chieftest jewel they bring from thence is the Maie-pole, which they bring home with great veneration, as thus -- they have twentie or fourtie yoake of oxen, every oxe having a sweet nosegaie of flowers tied to the tip of his horns, and these oxen draw home the May-poale, their stinking idol rather, which they cover all over with flowers and herbes, bound round with strings from the top to the bottome, and sometimes it was painted with variable colours, having two or three hundred men, women, and children following it with great devotion. And thus equipped it was reared with handkerchiefs and flagges streaming on the top. They strawe the ground round about it, they bind green boughs about it, they set up summer halles, bowers and arbours hard by it and then fall they to banquetting and feasting, to leaping and dancing aboiut it, as the heathen people did at the dedication of their idols.